Ein wunderbarer neuer Challenge Blog – Got Mojo? Die erste Challenge gleich mit einem schÃƒÆ’Ã‚Â¶nen Film-Zitat – hehehe- besser wÃƒÆ’Ã‚Â¤re nur noch – “Ich habe Melonen getragen!” – hÃƒÆ’Ã‚Â¶hÃƒÆ’Ã‚Â¶hÃƒÆ’Ã‚Â¶. Aber es war – “Niemand stellt Baby in die Ecke” – na wisst Ihr noch woher die Zitate kommen? DarÃƒÆ’Ã‚Â¼berhinaus sollte noch Filz als handgefertigtes Embellishment das Layout zieren – also auf! Such an awesome new challenge Blog – Got Mojo? The first challenge with a great movie quote- hehehe – the only better one from this movie would have been – “I carried a water-melon” – hÃƒÆ’Ã‚Â¶hÃƒÆ’Ã‚Â¶hÃƒÆ’Ã‚Â¶h – but it is – “Nobody puts Baby in a corner” – alright, do you know which movie it is? 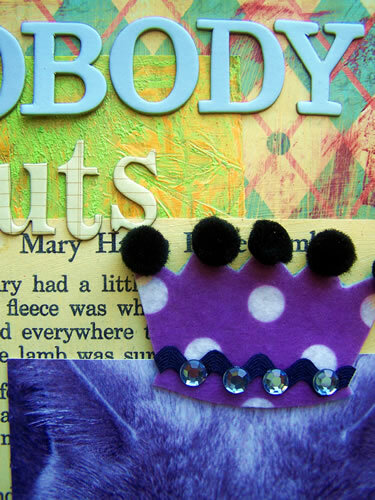 Furthermore we were asked to use felt as an handcrafted embellishment on our layout – alrigthy! Journaling: I love this little independent creature – cracks me up with is habits! 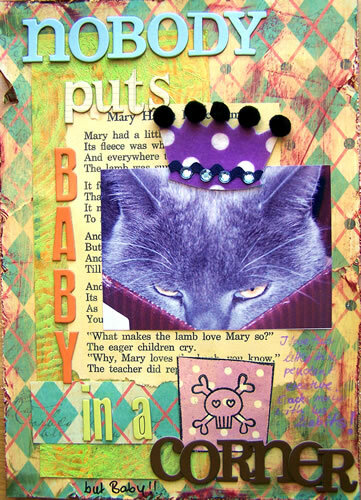 Supplies: Prima Paper, Acrylic glaze, Acrylic Paints, Ranger Distress Inkpads, Acrylic structure paste, bazill cardstock, Musik lyric sheets, Felt, Little fuzzy dots, sequins, zic zac ribbon, Heidi Swapp Chipboard Letters. P.s. Den Gewinner des Deutschen Papier-Pakets ziehe ich Mitte der Woche. I will do the drawing of the German Paper-Pack midweek. I L O V E this!!! Haven’t done it yet…. can’t find the right photo… d@rn……. What a DARLING layout Nat! Nat, wie cool ist das Layout denn??? Und mit dem Titel!!! Ich lach mich schlapp! Insbesondere weil wir letzte Woche bei einem MÃƒÆ’Ã‚Â¤delsabend bei mir noch Dirty dancing gesehen (und nahezu mitgesprochen) haben ;-))) Kult ist eben Kult, so sei es! Sag, wurde Niles nach dem Butler von der Nanny benannt? Nat, you totally rocked this. That pic is soooooo darling. Thanks for joining in! Oh Man I LOVE your layouts!!! I know you laugh like it’s an olympic sport, well your sense of humor is enough to make laughing contagious Nat! Sehr cool, die Krone auf Niles Kopf! LOL! Super Layout.